It was almost surprising, when XCOM first encountered their new foes in the third month of the alien invasion. XCOM forces were already stretched too thin, attempting to defend multiple continents and somehow break the ring of UFOs encircling Earth and blocking our communications. One of our strike teams was on mission when they ran into another team—almost literally. The other team was human, each dressed in business clothes, with body armor strapped over snappy vests and orange-red bandannas obscuring their faces. They gunned down XCOM forces, almost to a man. Aliens have attacked the earth, and the situation is grim. After all, humanity is badly outgunned. 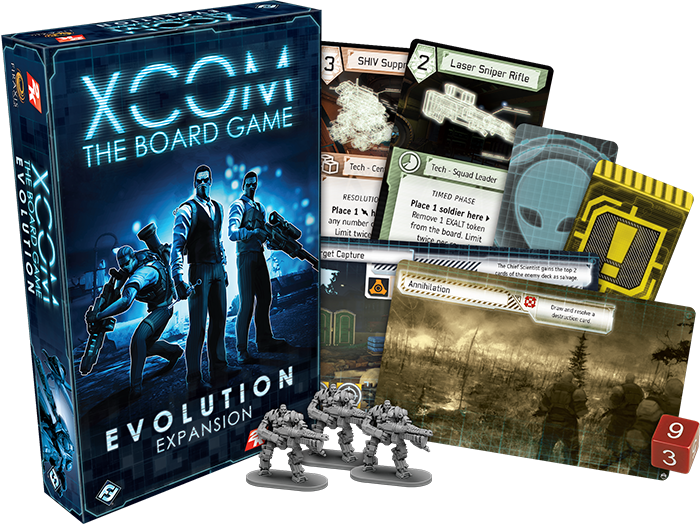 The elite paramilitary organization known only as XCOM is Earth's one hope for fighting off the invasion, but with the Evolution expansion for XCOM: The Board Game, you may find that your enemies are not only without, but within. The Evolution expansion changes the face of your war by forcing you to fight on two fronts: against the alien invasion and the sinister, secretive organization known as EXALT. Although your powers and technologies have grown, the obstacles arrayed against you have also been strengthened. Today, we’ll preview the new dangers and enemies that you may face within the Evolution expansion! The presence of EXALT forces on the battlefield has changed your war against the aliens. The lines between friend and foe are no longer the same as the differences between species. And just as the war has changed, XCOM: The Board Game has also adapted to counter your strategies and pursue new invasion plans. You’ll find two new invasion plans within the Evolution expansion, each one bringing a different challenge to you and your comrades among the XCOM leadership. The first invasion plan, Suppression, forces you to confront EXALT’s machinations as they directly oppose your efforts. This doesn’t just mean that you’ll be fighting infiltrators and undercover operatives alongside the alien menace, it means that every task is about to become a lot more dangerous through the use of EXALT tokens. 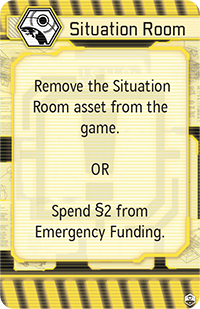 Each EXALT token corresponds to a space on the board and makes those tasks much more dangerous. 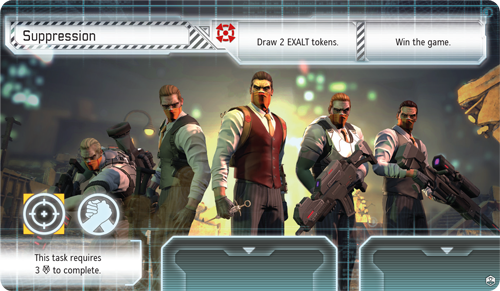 As a new timed event that can occur at any time, the app for XCOM: The Board Game may instruct the Central Officer to draw an EXALT token from the pool. 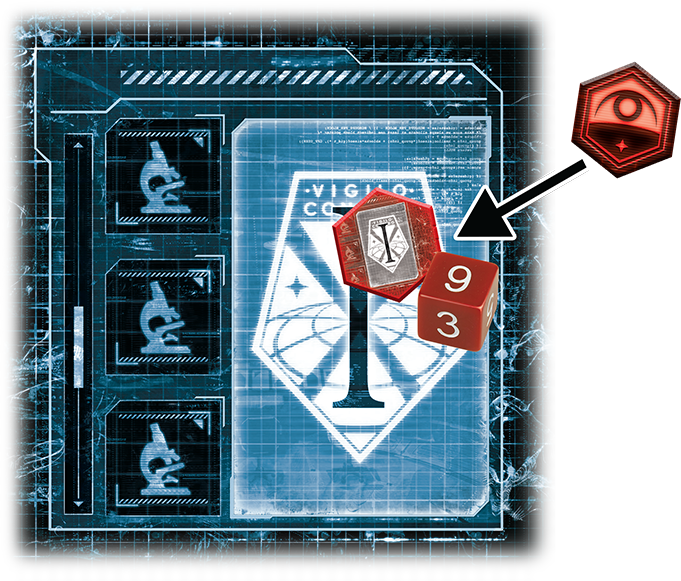 Each one of these tokens, when flipped faceup, specifies a location on the board: a continent, the satellites in orbit, a laboratory bay, the base, or the active mission. Then, whenever you’re attempting a task at the marked location, the task is considered dangerous—forcing you to use a different, six-sided alien die, which significantly increases your chances of failure. And to make matters worse, the only way you can remove one of these EXALT tokens is by spending one of your successes, rather than placing progress on your task. As you can see from the card above, you’ll be drawing these EXALT tokens very frequently under the Suppression invasion plan. Still, that’s not the worst you’ll encounter with the Evolution expansion. The second invasion plan introduced by this expansion demands your best efforts if you hope to survive. Annihilation is, in many ways, the ultimate challenge of your skills in XCOM: The Board Game. You’ll face waves of alien UFOs and invaders, communications breakdowns, rising panic in every continent, and the constant, unyielding attrition of your soldiers—all on top of the sinister plots of EXALT and the brand-new destruction cards introduced in this expansion. In fact, destruction cards are just one more way that the Evolution expansion strips any shred of peace or respite away from you. In the past, nothing happened when the base damage token advanced to a yellow space—other than your base of operations coming one step closer to obliteration. Now, these spaces are no longer safe: whenever the base damage token moves onto a yellow space, the Commander must draw the top card from the destruction deck. 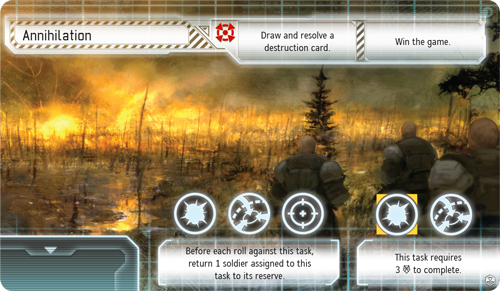 Each of these destruction cards directly affects one of the roles in XCOM leadership: Commander, Central Officer, Chief Scientist, or Squad Leader. And for each of these cards, the Commander faces a terrible choice. As the first part of the card, you may lose some crucial part of the XCOM workforce. 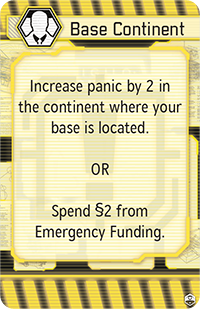 You might need to remove scientists from the game or increase panic by two in your base continent. Any one of these effects could essentially cripple your team, but you can avoid them—by simply spending two credits from your Emergency Funding. At first, paying two credits to prevent a punishing effect may seem tempting, but the more you siphon away from Emergency Funding, the more you realize that this money is truly the lifeblood of XCOM. You’ve always been forced to choose exactly where your Emergency Funding will go, and now, you have just one more thing to begging for your attention whenever you use those precious credits. The war against an alien threat has never been more difficult, and with the forces of EXALT working against you, XCOM has never been more outmatched. Still, there’s more than new threats and enemies to be found in the Evolution expansion—in a few places, you’ll find new allies and abilities as well. In our next preview, we’ll take a closer look at the new additions from this expansion that can benefit XCOM. For now, head to your local retailer and pre-order the Evolution expansion today! 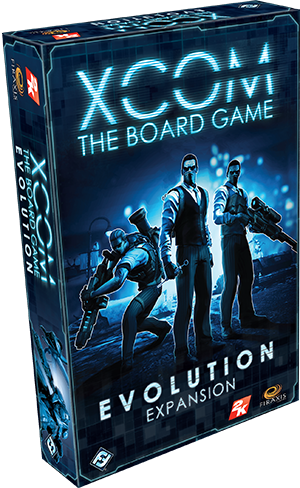 XCOM: The Board Game is a cooperative board game of global defense for one to four players. As unknown alien invaders press their attack against the earth, you and up to three friends serve as the department heads of XCOM, an elite, international military organization. You must destroy UFOs, research alien technology, complete critical missions, and find some way to prevent the collapse of human civilization. You are humanity's last hope.